One of my favorite royal couples is Britain’s King George III and his consort Queen Charlotte of Mecklenburg-Strelitz. She was born on May 19, 1744 in Mirow, Germany, the youngest daughter of Duke Charles Louis Frederick of Mecklenburg-Strelitz, Prince of Mirow. The future George III had been searching for a wife for a while, none of his choices meeting with the approval of his mother, when the match was arranged with the 17-year-old Charlotte mostly due to the lobbying of her widowed mother. Some in Britain were taken aback by the choice. 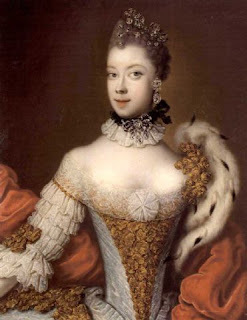 Charlotte’s brother was then the Duke of Mecklenburg-Strelitz but she did not have so royal a bloodline as many others and was considered by many to be rather unattractive (which seems unfair to me but, ‘eye of the beholder’ I suppose). Nonetheless, the arrangements were made and a Royal Navy squadron under the famous Admiral Anson was sent to bring her to England which proved to be a rather difficult voyage but she arrived safe and sound in early September 1761. On September 8, 1761 Charlotte and George were married at St James’s Palace though Charlotte, with her typical frankness and good humor, said that she was not very popular because she was not pretty but joked that after breaking her nose in a carriage accident she thought her looks improved. She was also not very warmly received by her in-laws, nonetheless her husband genuinely adored her and the two had a very happy and successful marriage with George III breaking family tradition in the House of Hanover by remaining steadfastly faithful to his wife. Over the years Charlotte bore her husband 15 children, 13 of whom survived to adulthood, so she certainly went above and beyond in securing the succession. As Queen, Charlotte was a model of gracious royal patronage. She supported Johann Christian Bach and met Mozart as a young boy and he dedicated his Opus 3 to her. She also supported Joseph Haydn, built orphanages, hospitals for expectant mothers and supported women's education. She also dabbled in botany, founded Kew Gardens and supported a number of artists. She had a very loving relationship with her husband and herself suffered greatly as he descended into madness because of his porphyria. She also maintained a long-distance friendship with the French Queen Marie Antoinette, the two being pen pals. Queen Charlotte worried alot about her French counterpart with the onset of the Revolution and prepared a place for the Bourbon royal couple should they be forced to escape to England. When the French queen was executed Charlotte was deeply disturbed and depressed by the news. Queen Charlotte looked after her husband for the rest of her life, being his legal guardian, never failing in her devotion until her death on November 17, 1818 with her son the Prince-Regent holding her hand. Although she was not given the warmest welcome when she first arrived in Britain she won the hearts of the people by her warmth, generosity and unfailing devotion to her husband and family. She was, in many ways, the ideal queen consort. I always did find CHarlotte an amazing woman and Queen-COnsort. Also, you should mention the Famous City of Charlotte, North Carolina is named in her Honour. It should b added that the City of Charlotte, N. Carolina is named in her Honour. She always was a Favourite of min in Monarichal History. The above picture of her suggests that she was better looking than other portraits of her (or her own comments on the subject of her appearance) indicate. I've seen numerous portraits of her, ones where she certainly looked more "distinctive" than others but none changed my opinion. She wasn't a drop-dead gorgeous classic beauty by any means, she had a very unique look but, eye of the beholder, just my opinion, she didn't look like an unattractive woman to me.